The Philips Brilliance monitor, model number 328P6VUBREB, is a 32-inch monitor with a 3840 by 2160 resolution at 60Hz, with a 4-millisecond response time. Offering up to 600 nits of brightness at its peak and a 3000:1 contrast ratio, the screen offers 12-bit internal processing and is based on a 10-bit panel, allowing it to reproduce 1.07 billion colors. The screen also includes support for high dynamic range (HDR) for a more vivid image. To help with comfort, the "LowBlue Mode" can reduce the amount of blue light rays that are emitted from the screen, light which can cause damage to a user's eyes over time, and can even affect their sleep schedule. The screen is mounted to a "SmartErgoBase" that offers 170 degrees of swivel between -5 to 20 degrees of tilt, can be rotated 90 degrees to a portrait orientation, and up to 7.1 inches of heigh adjustment. At the same time as being a monitor, Philips has given the display enough functionality to make it a USB-C dock. Connecting to a device over USB-C with 60W power delivery for recharging with USB PD Version 2.0, it also includes a DisplayPort 1.4 input, two HDMI 2.0 inputs, and four USB 3.0 ports, with one offering fast charging capabilities for mobile devices. To take advantage of the display inputs, the monitor's MultiView mode enables for two video sources to be used at the same time, allowing for two computers to be connected for multitasking, or even video from a media player. Rounding out its connectivity options, there are microphone and headphone ports for audio, 3-Watt stereo speakers, and a Gigabit Ethernet port. 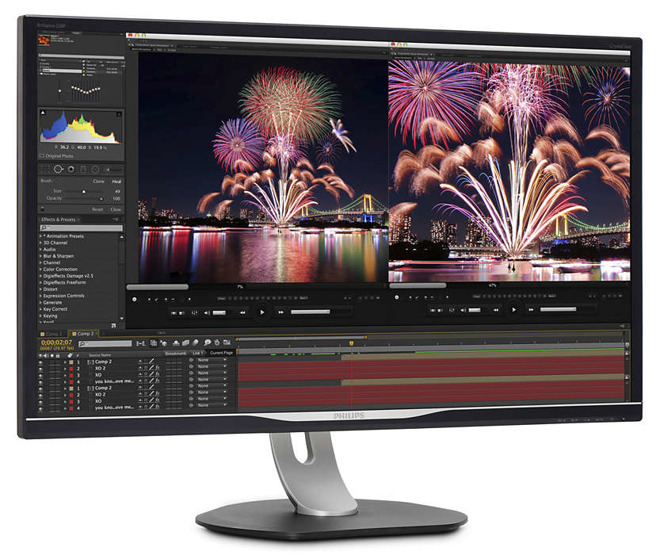 Philips will start shipping the Brilliance 328P6VUBREB in Europe from November, priced at £559 ($740) in the United Kingdom. Pricing and availability in the United States and other markets has yet to be announced.